In America, New Year's Eve is a cold night where you gather with friends and drink champagne and watch fireworks as you countdown until midnight. I've had good NYE's and bad ones, but often they're pretty detached and just an excuse to get tipsy with friends. I have only ever spent New Year's in America or in the air flying from one country to another. But when booking flights for my Southeast Asia trip, it just so happened that the dates for Bangkok were during Thai New Year, aka Songkran. 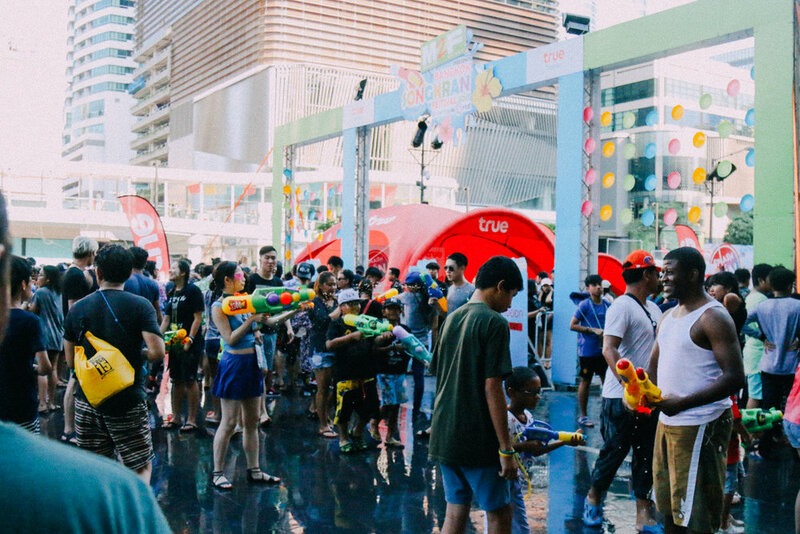 Researching this led me to find out that the Thai people go all out for this time of year and turn the country into a water festival that can't be avoided. This sounded like fun to me. Knowing it was going to be one of the hottest months of the year in this region, getting sprayed with water didn't sound half bad. I read that you have to be careful though because the locals WILL disregard that you are carrying baggage or expensive electronics and throw buckets of water at you, so I worried a little for the safety of my camera but figured I'd find a way for it to survive. As we took a taxi from the ferry terminal in Phuket to the airport, I could see Songkran beginning. Little children lined the streets in kiddie pools and carrying buckets of water. Some had water guns too. They were prepping to start the water fights. As we passed through the city, I could start to see a few engaging in the holiday by using hoses to spray water at their kin. 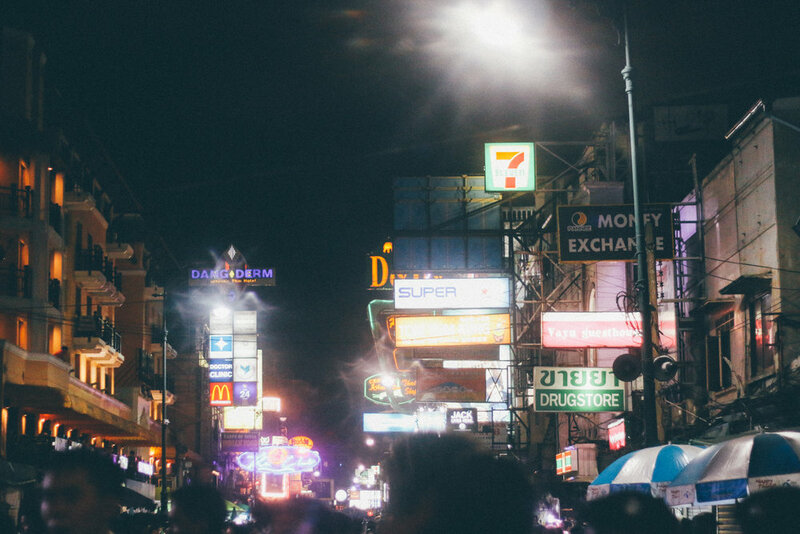 When we arrived into Bangkok, our taxi slowed down a bit as we approached the area our hostel was in, and that's when the first bout of water hit the car and I was taken aback. I guess even cars aren't safe from getting splashed. After we got settled into our room, we went back out into the night and tried to find some food. As we headed to Khao San Road, we soon realized this was a mistake. The area was FILLED with young Thai people to the point that there were gates put up and police enforcement everywhere. It was hard to walk through the crowded streets and a young man ran at my boyfriend's face with an open palm and he panicked for a second before the guy just wanted to put a clay mixture on his face and say Happy New Year. I too got attacked with a bit of clay as well as we walked. We got hit with a bit of water, but thankfully not too much and found out that we couldn't go where we wanted because the main road was shut for more individuals. The next day, as we were heading out to go temple hopping, someone at our hostel warned me that I shouldn't be taking my camera out, but I couldn't be bothered with listening. Thankfully my camera is fairly waterproof and WHY would I not go out with it when I'm in a new country and want to capture it? As we walked to the main road, we got splashed a little bit, but most people left us be because we didn't have water guns. There were Songkran festivals everywhere we went. Even at the temples, there were places to give respect to the New Year and even get whacked over the head by a monk with a large wet broom. EVERYWHERE in the city was taking part of the festival. As our tuk-tuk took us from the temples to the CentralWorld mall, we got buckets of water thrown at us. We arrived at the mall pretty soaked from facetious kids who thought it would be funny to dump water right on me and my camera. At the mall, on both sides of the street, there was water in some form. One side had a giant outdoor dance party with hoses spraying water over people below. The entire entrance area to the mall was filled with a concert stage, people with squirt guns and even a giant Pikachu. We definitely got in the middle of a water fight on the way in and out. After we got back to our hostel, we changed into clothes I didn't mind getting wet. 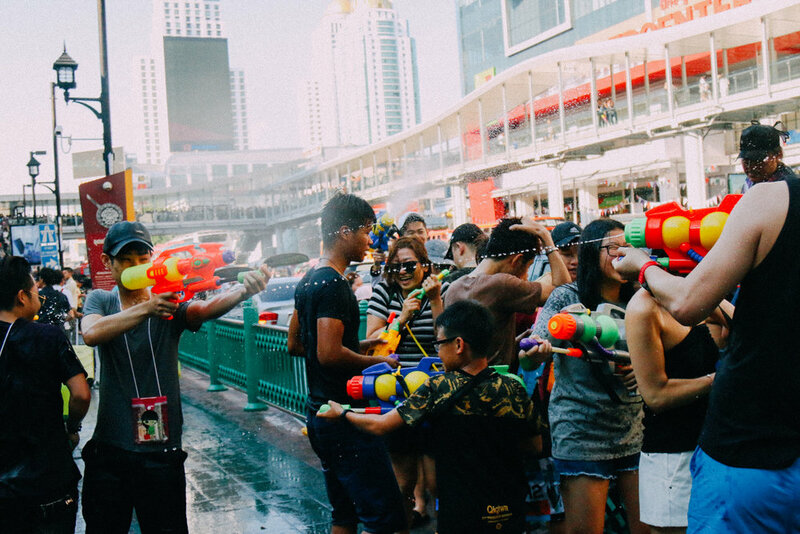 I put my waterproof housing on my action cam and we borrowed some water guns from the hostel and filled them up and decided to go out into the streets of Bangkok and officially take part in Songkran. As we set out, children attacked us with buckets of water, adults sprayed us, and I was entirely wet within 2 minutes. Because we now had guns, we were targets and that meant no saving from getting shot. As it was hot AF, I was okay with this as the water kept me cool. We went back to Khao San Road, and since it was daytime, we could actually see everything and finally get through the barriers. It was a pure water fest at that point. We walked along the road, getting shot at as we went. I have terrible reflexes, so I was never able to return a shot back at whoever got me, but it didn't matter because we were all just spraying each other and it was glorious. At first, I felt back about being a tourist taking part, as if I was co-opting some of their culture, but there were just as many tourists as locals, so we all took part in this giant New Year's celebration. Even though I was sick most of the trip, this was the one time where I felt the most like myself and happy and positive. Being a part of something large and fun was just what I needed to pull my spirits up. It was the best feeling to get a sneak attack bucket of water over the head, and I really had nothing to complain about in that moment. I was happy to celebrate another country's holiday in a way that felt so pure and exciting. It made me wish that America could adopt something similar to this. I truly suggest that if you are ever going to Thailand in April, that you try to align your time with Songkran. Because of the holiday, many shops are closed, however, the city comes alive with water and it's an experience you must enjoy in person. Out of a trip of many unfortunate moments, this was a definite highlight. 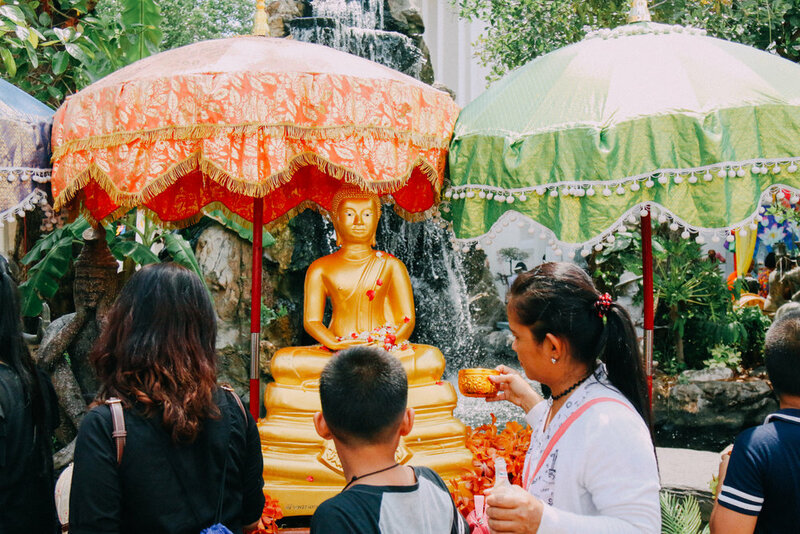 Bangkok is a great city to celebrate the New Year in, but I've heard that Chiang Mai is even better. I know it's a bit late, but Happy Thai New Year!